Why I will never again cede control to trained volunteers #cilled #narrowboat #england – The Diesel-Electric Elephant Company. Why? 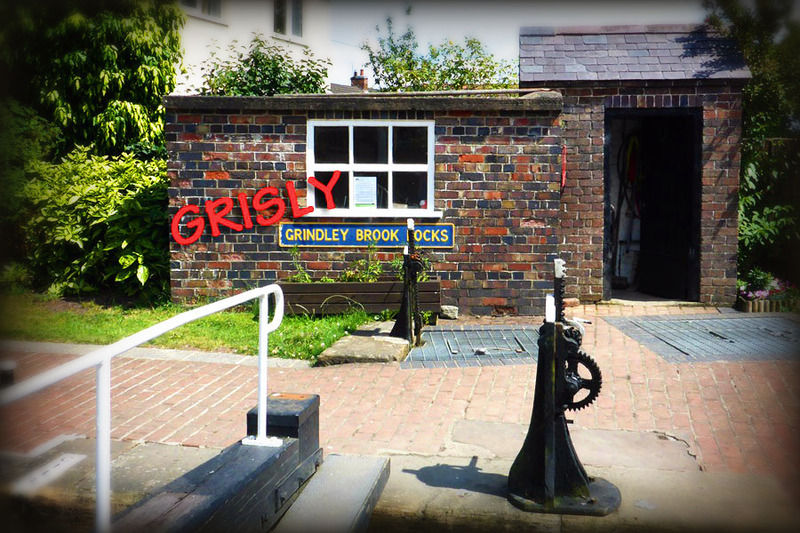 Because cilled at Grisly Grindley Brook locks, that’s why. We were about thirty seconds away from disaster, and it was all my fault (seriously). It is too easy, especially when, like me, a chap is still wet behind the stern-gland, to fall into the trap of ceding control to chaps bathed in CaRT logos, and to just follow their orders. That – for absolutely the very last time in my narrowboating life – is exactly what I did wrong at [Grisly] Grindley Brook Locks on Day Two of our expedition up the Lim… the Llangollen. There’s no denying that responsibility for what happened is mine, the boat is mine – but I will say that the trap I fell into was deep and wide and welcoming. The volunteer was distracted, not wholly present in the moment, and I was too green to be wary (and that’s all I’ll say in my “defence”). These “the powers that be”, The Canal & River Trust, that organise, train and certify these lovely volunteers have, like all such vertebrae-challenged organisations, legal disclaimers buried in virtual micro-dots in the small print of their ill-linked website. These disclaimers are expressly buried because, while they want to maintain a skirt to hide behind in court, the organisation also wants to maintain a cloud of “authority” about the volunteers: volunteers help with water-conservation and they help keep traffic moving quickly, something that individuals wouldn’t necessarily do. There’s a reason why organisations adopt a touch of the old logo/uniform, and it is no accident of branding. The effect on unwary “civilians” has been studied long and it has been studied hard: the unwary – me in this instance – obey a uniform. Time came for the Bro to apply a few horses to move the Cardinal from the middle chamber into the top chamber and suddenly lots of nothing much happened, the Cardinal wouldn’t move from between the gates. As individuals in the big, wide world oft do, we both assumed that it was something that we or the Cardinal were doing “wrong”, and both ran mentally through the spectrum of gearbox/prop/whatever explanations before realising that the Cardinal was actually jammed on the cill because of insufficient water in the chamber. Worse yet, the water level was falling rapidly and the Cardinal was seconds away from disaster, dropping backwards all the time. The volunteer that I had, up until that point, been following as an authority figure was actually away with the fairies, locked in his own world (it was hot, very hot, and doubtless he’d successfully helped many others through the lock earlier, leaving him with less energy and concentration than he might otherwise have had on a better day). Another chap bringing the next boat up through the first chamber had opened both paddles prematurely, beginning to drain the chamber that the Cardinal was still in – just halfway across the “cill”, the step… The Cardinal was tipping backwards into oblivion. The process of sinking this way is a fast one; the more you sink the faster you sink, and there’s a swiftly-reached point at which all is lost irretrievably. The overall drop/rise at these locks is 19′ 11″. If you’re of stout personality mayhap try a google search for “canal boat accident in lock” and have a look at the images. That’s what we were just seconds away from. Looking back down the lock flight and realising what I had allowed to happen I then had to assume the persona of a parade-ground Sergeant-Major, bark at the chap who had opened the lower paddles to shut them, try to attract the attention of “my” volunteer and then scoot to the top to open paddles and let more water down to refloat the Cardinal. Folk obey uniforms, but I can tell you that they also obey 120db orders. I have no idea how I didn’t pepper my orders with purple expletives, I actually don’t think that I had the time to insert them, I just wanted action. The official summation, a few minutes later, was to remark “oh well, we all make mistakes”, and to then wander off. This was a carefully vanilla reaction, but hardly the regretful wailing and gnashing of teeth that I might have hoped for. There is a series of water points just beyond the lock, and it was moored upon these that the Bro and I took half an hour to let the gibbers subside a little. The moral of this rude awakening? Well, the assistance of lock volunteers, liveried, logo-bearing, certified by CaRT or otherwise is very much appreciated, but tis I and I alone who will be wearing the uniform and giving the orders on the return trip that I have yet to make through these locks, and through all others. My boat, my home, my responsibility, so back away, please. The rest of Day Two? Well, that was great fun. We did other locks, we navigated under lift-bridges and we found a splendid mooring at the end of the day (where we gibbered some more, until we ran out of gibber and had to start in on the “general shakes”). This was the first of our lift-bridges, where the Bro laboured under the vulture-like gaze of an eleven-car queue at 08:00hrs while I slowly manoeuvred the Cardinal through. We also encountered “the phenomenon of the Llangollen” – some seriously miserable people. The matter remains anecdotal, not empirical, but quite independently the crew of the Cardinal and I both noticed a distinct one-third, two-thirds split becoming evident in the people we met (reinforced and confirmed by the observations of later days). Roughly one-third of people on and about the Llangollen Canal are happy, friendly, charming and well worth their salt, as the Legate Gettaruddygrip-Centurion used to say when I was in the Legion; the other two-thirds of people reminded us of nothing more than bulldogs standing with their nuts in a patch of stinging-nettles. Some folk we encountered made us wonder if perhaps we had brutally murdered and then eaten their family pets – silences, glares and a distinct atmosphere of almost menace. Others screeched (at each other), although it must be said that one “lady” did screech at us, but only because those at whom her waterborne ire was really directed were still literally about half a mile and more out of earshot (” Oi! That’s OUR lock you dah de dah de dit dit ‘ecking ‘ankers…). We copped for the practice-run of their impending lecture on how they ought to have (what? held a seance? …and) known that she was about to appear around the distant canal corner… Fisticuffs seemed likely, since those she was screaming about were from Europe, from one of the countries wholly familiar with serious boating and yet also with a National character not lending itself easily to the acceptance of friendly correction or pithy social observation. The Cardinal, in spite of having his bottom scraped on a cill (if you’ll pardon the English understatement of the decade), seemed anxious to press on, and was often impatient while waiting for us to lower the paddles and open the gates for him. Day Two of the Llangollen expedition was thus, you’ll surely agree, action-packed and offering experience like no other. Day Two was, I venture, at least a day and a half, possibly more. It proved if nothing else that I can still bellow orders. Day three, to follow, was much more pedestrian – if you discount our first encounter with a canal tunnel… sailing into Middle Earth, for all that we were worth. Splendid stuff overall and, while all that ends well is not, actually, well, well is far and away the best way for all to end. Well, I blame the omen giver. It was a lousy omen for such near disaster. I’m glad it turne dout mostly well. Hopefully Cardinals bottom will have no lasting defect. I must say, all this moving about seems like a good deal more work than I realized. All this time I’ve been picturing a lazy bucolic existence for you but now it seems to me you’ve retired into manual labor. Hmm, maybe canal boating is not quite so relaxing as I had imagined. I can see me being the cause of a number of disasters all along the route if I dared try this. With me it seems to be the small details that catch me out most often – my favourite trick is setting off without the tiller extension fitted… doh! You were lucky this time and Im so glad. My theory for the Llangollen two-thirds is the overlying fear of the rain that if not actually falling is very likely to be so shortly, gives you that morose character. Thank you, very much appreciated! Many thanks, sir – very much appreciated! everything happens slowly on the canals, ,except emergencies. These happen fast, very very fast!! Good gracious what a near miss! Glad you came through it all, I guess some people just don’t turn up for the H&S part of the course.